Your patients ask a lot of their eyes. Life is visually demanding. In a single day, your patients subject their eyes to thousands of different situations. And whether it’s reading, driving or playing a round of golf, they rely on their eyes to give them the clear picture. Having eyewear that delivers continuous performance is essential to getting the most out of life – and it all begins with the lens material recommendation you make. Not all eyeglass lenses are equal. Trivex material provides the complete package of optical quality, lightweight comfort, strength and protection – the critical performance characteristics called for in everyday living. Trivex material is True to Life. 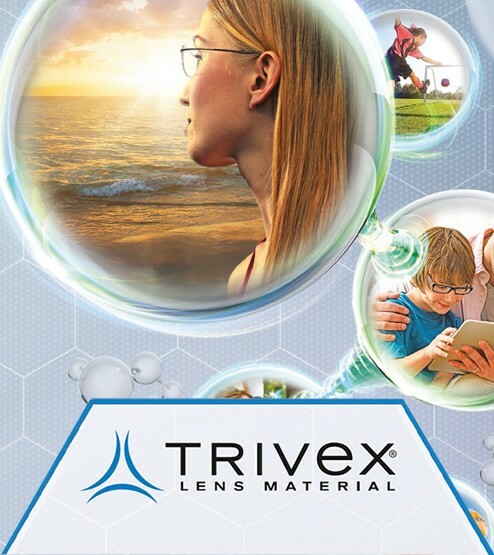 Trivex material provides the optical quality that optimizes corrective prescriptions and helps to reduce eye strain. Lenses made with Trivex material are ultra-light for ultimate comfort; Trivex material is one of the lightest lens materials on the planet. For the demands of everyday living, eyeglass lenses need to provide protection from unexpected impact like while playing sports or working in a hazardous environment*, breakage and from the sun’s harmful UV radiation. Who should wear lenses made with Trivex material? Lenses made with Trivex material are a great choice for anyone who leads an active life and expects clear, crisp vision correction, lightweight comfort and protection from their eyewear. With Trivex material, children gain the benefits of impact resistance PLUS great optical performance. For the fashion-conscious, lenses that provide optical quality, lightweight comfort, strength and protection are always in style! Trivex material is a perfect fit for all frame designs, and it is especially well-suited for rimless (drill-mount) and semi-rimless (supra) styles. * Impact resistant lenses are neither shatter proof nor unbreakable. Coatings may alter the impact resistance of any lens material.